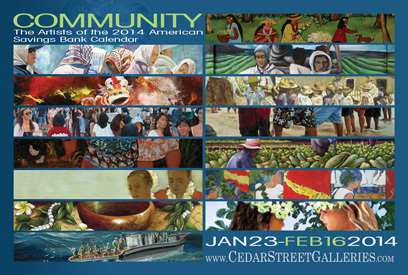 The Second Floor @ Cedar Street Galleries will be hosting the “Community” art show which features the works of the artists in the 2014 American Savings Bank Calendar. The artists showcased capture the essence of Hawaii’s heritage through the familiar scenes of our islands — a montage of images that we feel represents “Community.” The opening reception will be held on Thursday, January 23, 2014 from 5:30 p.m. to 8 p.m. and is free and open to the public. The show will run from January 23, 2014 to February 16, 2014. Paintings, Sculptures, Glass, Wood, and Ceramics. Copyright © 2014 Cedar Street Galleries. All rights reserved.